We understand that some people have had negative dental experiences or are fearful of pain. With sedation, you can feel confident that you’ll be able to complete the dental care you require. We’ll administer local anesthesia to numb a specific part of your mouth. Though it’s given via injection, most people don’t feel the injection when it goes in. It can last for several hours and make speech or eating more difficult, though side effects are rare. Unlike the case with general anesthesia, while you’re under local anesthesia, you will be fully conscious. 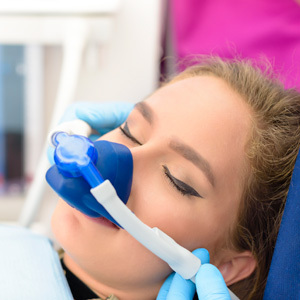 You’ve likely heard of laughing gas as an option to help you stay comfortable through dental procedures. A mask is placed over your face, and you can breathe normally while the gas enters your system. A feeling of tingling in your arms and legs or lightheadedness may occur, though you’ll feel calm and comfortable while fully conscious. The effects wear off almost immediately after the mask is removed, and you can drive home or continue with your daily activities right afterward. If you’ve been avoiding your routine checkups or feel that you may need more complex work, we’ll evaluate you and provide you with the dental solutions you need. You deserve to show off a happy, beautiful smile. Contact our friendly, helpful team today to schedule a visit! We’re in-network providers with most PPO plans.